The Loveless is along the same lines as River's Edge, to some degree, but in a highly stylised kind of way. Robert Gordon's sort of rockabilly in that, and he's brilliant. It's full of almost clichéd dialogue and things that could have come out of Airplane! : "Looks like I picked the wrong week to quit sniffin' glue!" It's very stylised and almost hammy, but there's something you can get lost in. This world, these people living by a certain code and playing their lives out that way. It evokes such a great feeling. At the start, when Willem Dafoe is at the side of the road with his bike early in the morning. He does a voice-over and it's all quite hammy, but it's just brilliant. It reminds me in a very strange way of Smokey And The Bandit. 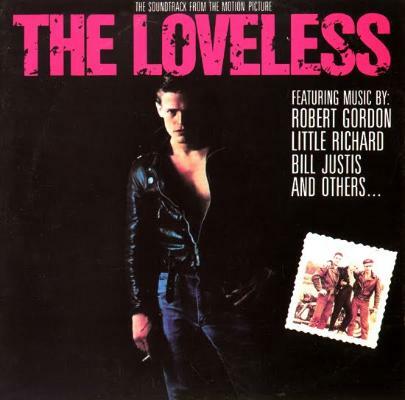 Like Smokey And The Bandit, The Loveless opens very early in the morning in the American South, the trucks starting up, and it's really evocative! You can feel the early-morning heat of those places. The Loveless does that really well, creating this space that feels like time isn't moving. I lived in New Orleans for three years, and the American South is very much like that. Not that nothing's going on there, but it's got a different clock to New York or London. Those films really capture this feeling. It's not sleepiness, but it's just a different time. As I've been saying about all of these films, I the ones I can get lost in, be they deeply serious or sort of campy like The Loveless. When things like that are so well-crafted it really blows my mind.